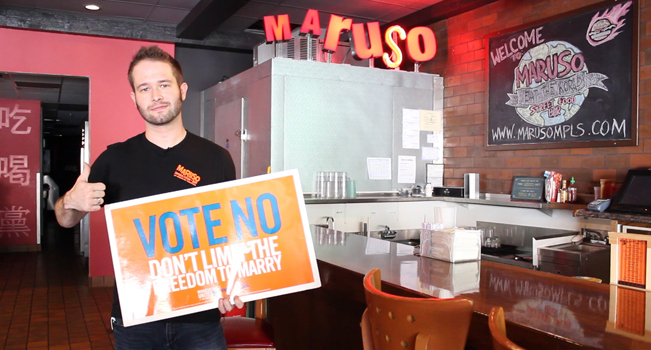 This week we’re bringing you the 8th installment of a video series titled Chefs 4 Vote NO! with Chef Andrew Garrison of Maruso Street Food & Bar in Minneapolis. Watch these Twin Cities Chefs as they speak out against the Minnesota marriage amendment through the use of personal philosophies and stories. It’s a beautiful journey featuring one community supporting another. Watch it. Laugh, love, cry and then share the message. Tell all of your friends to watch as two communities come together in the pursuit of civil rights and don’t forgot to Vote NO! in November. For a list of all past episodes, visit http://chefs4voteno.com.